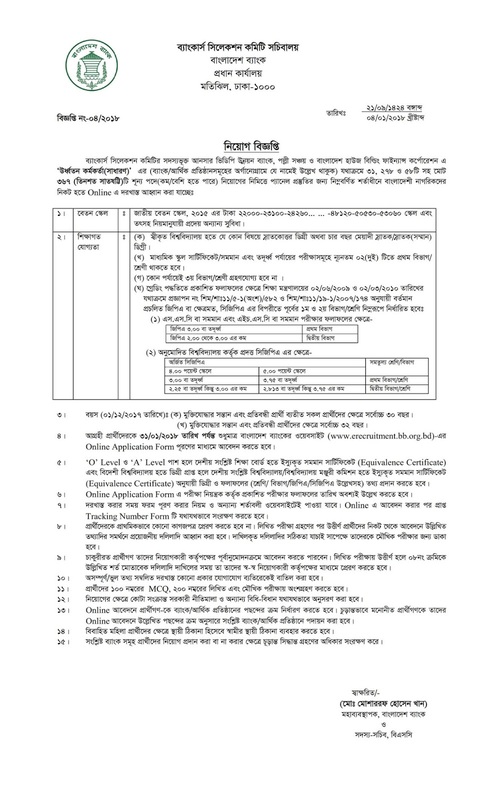 Here we published Bangladesh Bank Job Circular Advertisement for the post of Senior Officer(General) of Ansar VDP Unnoyon Bank, Polli Shanchoy and Bangladesh House Building Finance Corporation(BHBFC). Please view this Job circular below and apply from online. For more Bank Jobs, Exam Schedule, Admit Card and Related Notice please stay with us. For more about BB Bank visit there official website and also our website. We are update regularly and surf better result for all viewer. Educational Qualification: Four year Honors/Masters degree from any Govt. approved university with at least 2 first division/class. Third division/class in any examination is not allowed for this circular. Before apply check your eligibility. Pr-requisite- Scanned/Print then Attached of your passport size photograph and signature upload for online application.